For a grand entrance and an even bigger ceremony, this mandap choice is a superb and striking opportunity to adorn your wedding or banquet in pure white and regal gold, working together to create a clean and impressive mandap experience – and as one of our biggest pieces, this is indeed a superb choice for anyone who is keen to opt for big coverage without necessarily relying upon ornamental touches. Not unlike our Drape Mandap, this setting relies upon crisp, white drapes, while it is supported by traditional gold pillars inspired by traditional Indian architecture dating back centuries. Coupled together, this mandap provides a regal and luxurious atmosphere at any ceremony without distracting away from the marrying couple. 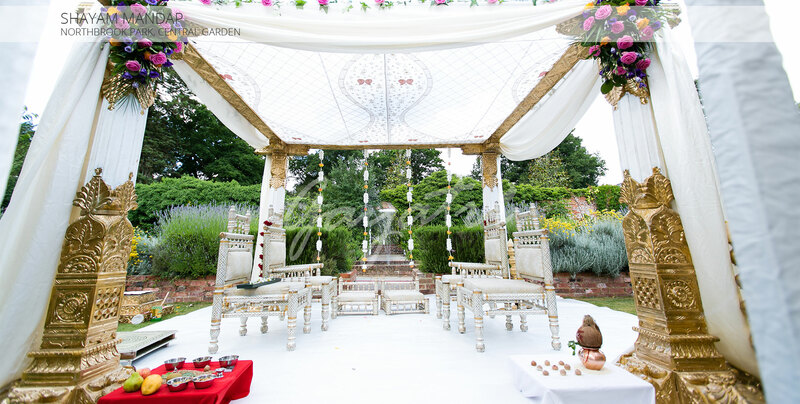 White and gold remain popular colours at spiritual weddings and ceremonies, and therefore we have ensured that this mandap offers a natural and eye-catching blend of the two, all the while letting a touch of decadence reign at the forefront of its design.